Excellent grip on wet roots and rocky terrain. A great sticky tire for wet roots and rocks made to handle all circumstances. Softer tread compound allows the tire to flex without tearing knobs. The C-18 Green Stripe has a lighter carcass (one textile ply less) than the C-18 Yellow Stripe. 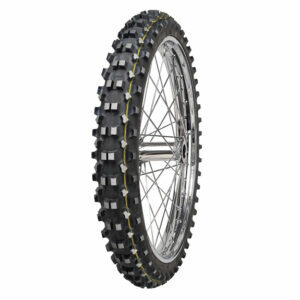 The tread design provides optimum riding properties in all riding modes. Suitable for country cross competition too. The tread compound is optimised for braking and precision steering. Great performance in all riding modes on softer terrain in rally competitions. 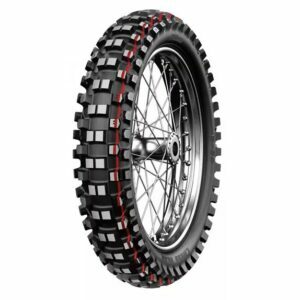 The EF-07 tread pattern in the Super version (marked with yellow stripe) was designed to meet the FIM specifications (Federation International Motorcycle) for sport enduro competitions and developed in cooperation with many top enduro riders. OUTSTANDING GRIP AND TRACTION – Knob distribution and geometry are designed to offer outstanding grip and traction with high resistance in both dry and wet conditions, and from soft/loose to hard terrains. WIDE RANGE OF TERRAINS – The tread compound is resistant to tearing and cutting, and suited to a wide range of terrains – from soft and intermediate to rocky conditions; the carcass of EF-07 is stiffer than with the green stripe version. The EF-07 Super Light (green stripe) is made from a slightly softer tread compound than the Super version (yellow stripe). It ensures excellent handling in wet forest and meadow soils. It is designed for the toughest competitions and conforms to the current FIM regulations in terms of design and tread depth. Open tread design ejects mud and loose ground that a trials tire will not. Very good grip properties and slightly faster than the yellow stripe version. A spaced knob design works well in mud or sand. 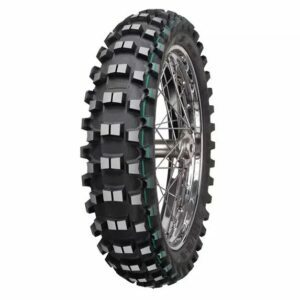 Tread knobs distribution and geometry are designed to offer outstanding grip and traction in both dry and wet conditions, from soft and loose terrain to hard ground. Meant to take the off-road terrain where conditions can be extremely tough to get traction. The lightweight, flexible carcass with a reinforced shoulder guarantees a large contact surface and good shock-absorption. It resists tearing and cutting and is suited for tough to extreme off-road conditions; the carcass is more pliable than with the yellow stripe version. The best choice in races such as Erzbergrodeo, Red Bull Romaniacs, Sea to Sky, Roof of Africa and many others. For the most demanding conditions. EF-07 Super soft is a rear tire combining the enduro tread and ultra sticky soft compound for extreme, most demanding conditions. The tire is best suited for extreme rocky, stony, wet and mud terrains. It is designed for vertical climbs and used in extreme enduro races. Its significantly enhanced carcass and extra soft compound are ideal for all terrains and offer an excellent grip. The EF-07 Super Soft is best paired with the front tire, 90/100-21 C-19 Super Light (one green stripe) for extreme grip.